There are five big mistakes that people make at the contact point. Any mistake at this point will generally have a very adverse effect on the shot as there is no time to correct the mistake. The two biggest problem will either be not getting the racquet face vertical or not getting the contact point far enough out in front of the body. Both of these mistakes are closely related and generally if one is done, the other is also happening. Often time not getting out in front of the body enough will cause the player to open up the racquet face in order to hit the ball even when trying to get the racquet face vertical.. If the proper grip is being used and swing is correct the racquet face will be closed until right before contact. Hover over the below image to see the racquet face being closed right up to the proper contact point. This means the only way someone can contact the ball late and get a vertical racquet face is to move the wrist and/or forearm. This will generally cause the racquet face to open up too far as it is very difficult to time the moving of the wrist correctly so that at the very millisecond the ball is being contacted, the racquet face is vertical. It is hard enough to time the swing so the ball is hit with a correct swing that doesn’t involve moving the wrist, adding a second timed element (moving the wrist) makes it virtually impossible to have a consistent forehand. At the correct contact point it is much harder to move the wrist then if the contact point is closer to your body. 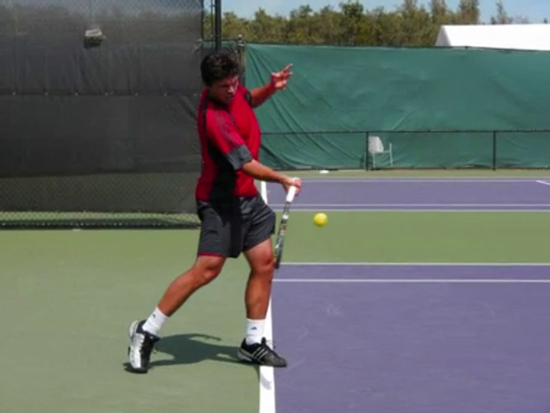 Now take your racquet and move the contact point earlier in your swing and see how much easier it is to move your wrist. If you get the racquet far enough out in front of you, the wrist will not need to move to get the racquet face vertical. The second common mistake is not getting the racquet vertical at impact. This will mainly happen because a player is trying to hit the ball before their ideal contact point, or in other words are hitting the ball late. As stated before, the racquet face will be semi-closed until right before impact. 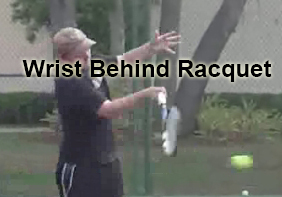 This will force many players to move their wrist to attempt to get the racquet face vertical at impact. Generally these players will not be able to get the racquet face vertical as it requires perfect timing. They will usually end up over compensating and moving the wrist too far and the racquet ends up open. This makes it virtually impossible to get topspin on the ball and often forces the ball too high. The third big mistake is not having the belly button pointing towards the net post. If the belly button is pointing too much towards the side fence the body is either not rotating forward enough which will cause a lose of power as the kinetic energy chain will be broken or the player has just started the swing way too late. If the belly button is pointed too far towards the net then the player has most likely swung horizontally instead of vertically. This can lead to a much smaller hit zone which can make the swing much less consistent. For advanced players who use an open stance the belly button may be pointing towards the net at contact, but they will still swing vertical and keep their hit zone elongated. The fourth and fifth big mistakes are also mistakes that are done on the forward swing. This is mainly because the forward swing happens so quickly that these two mistakes start during the forward swing, but continue to happen at the contact point. The fourth big mistake is the head moving as the ball is contacted. The brain thinks the racquet hits the ball before it actually does so many players will lift the head up early to see where the ball is going. The head is the heaviest part of the body so any movement of the head will move the center of gravity. As the head moves up to look it will move the racquet too. A sure sign of early head movement is the ball hitting off the frame. Jumping too early can lead to bad balance by either pulling the body too far forward which will move the bodies center of gravity too much (destabilizing the body) or by pulling the body too far to one side (usually to the left). Pulling the body too far to one side will also move the center of gravity too much and have the further problem of making the racquet swing end up too horizontal. Jumping also can lead to needing to use mostly the arm as it can break the kinetic energy chain which can keep it from flowing correctly. Jumping may happen, but should only happen after the ball has been hit as a product of the bodies momentum.